One of the best reasons to install hardwood flooring into your home is its ability to last a lifetime. With a little TLC and occasional refinishing, hardwood can last for decades. But what about engineered hardwood? Can you refinish that too? It depends on the engineered hardwood. Engineered hardwood has a hardwood surface. And that surface layer can be refinished. How many times depends on how thick the hardwood layer is. The layer of solid hardwood on engineered flooring is known as the wear layer. It ranges from 1mm to 8mm thick depending on the quality of the flooring. When an engineered floor is refinished, the sanding process will eliminate anywhere from .75mm to 1mm of the wear layer. That means you can refinish your engineered hardwood several times before you eliminate the wear layer altogether. 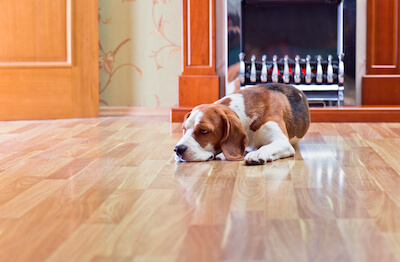 A floor with hardwood layers of 1mm should never be refinished. With 8mm of hardwood layer, it can be refinished up to 8 times. Several factors reduce the number of time an engineered floor can be refinished. If moisture damage has occurred, cupping may occur near the edges of the planks. This can require more layers to be removed in order to bring the planks flush again. If the cupping is severe, refinishing may not be possible. Uneven floors can have low spots that require more sanding. If refinishing is too deep and goes beyond the wear layer, you’ll have to replace rather than refinish. If severe damage is done to the planks, you may be able to replace the damaged planks or repair the scratches with stainable wood filler. This can help you save time and money during the process and get more life out of the rest of your floor. In some cases, adding a layer of polyurethane sealer to the existing finish, a process known as refreshing the finish, is a good option when only light wear has occurred. This can be a possibility if the wear hasn’t penetrated the wear layer starting to show on your floor. Refreshing can be done every 4 to 7 years depending on how much traffic the floor receives. If you don’t know the history of your engineered floors, then investigating the condition will be necessary. Removing a floor grate may expose an edge profile of the wood and allow you to measure the remaining wear layer. You can also remove baseboard trim to have access to the side. If you need further assistance, we’d be happy to help and provide you with options on the best course of action for your flooring needs.